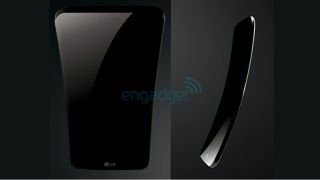 A new report is showing off the LG Flex – or G Flex - in three press renders, boasting a more detailed view of the curved smartphone. Engadget purportedly obtained the press renders of the 6-inch smartphone, which is set to go head to head with the Samsung Galaxy Round. LG previously confirmed that the new OLED panel will be 0.44mm thin and weigh just 7.2g, "even with a 6-inch screen", lending further proof to the Flex's rumored size. The flexible panel will use plastic substrates instead of glass, allowing it to be bendable and "unbreakable". Engadget's sources are also saying that the new smartphone will be ready for launch next month, which isn't the first time November has been named for the LG Flex's launch. Though nothing official has come from LG in terms of pricing and availability for the Flex, LG has already confirmed that a 6-inch curved OLED display and curved batteries are already in production, so a November launch may not be too far off the mark. While both Samsung and LG have competing curved smartphones readying to be launched, the above renders show again that LG may be curving differently to Samsung. Earlier rumors for the LG showed a similar designed, where the Flex is curved from the top to bottom, essentially curving from the ear to jaw if you were to hold it to your ear. Samsung's competing curved smartphone, the recently announced Galaxy Round, curves from the left to right, hugging around your cheek if held up to your face to take a call. The question then becomes: which will be more comfortable and organic to hold? Until LG releases official photos and, more importantly, we get hands-on time with both curvy phones, we won't truly know. While Samsung and LG battle it out in the "flexible" display sphere, the internet doesn't care much for curved smartphones.